The certified hospice home health aide (CHHA) is a valuable part of the Samaritan hospice team. The team is composed of your family physician and/or specialist, plus a Samaritan physician, nurse, social worker, spiritual support counselor, home health aide, volunteer, and other practitioners, if necessary. Together, the team addresses the physical, emotional, and spiritual needs of you and your family. Your hospice home health aide is currently licensed in New Jersey and received a certification from the New Jersey State Board of Nursing. They aren’t nurses; however, they do work very closely with the hospice registered nurse to provide the amount of care that is in the plan of care. Every Samaritan aide is also certified in the Pressure Ulcer (bed sore) Prevention Program. CHHAs do not administer medications. They assist with activities of daily living such as personal hygiene. 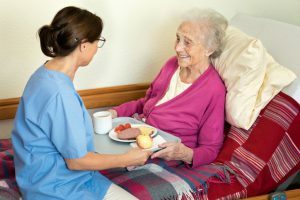 They may prepare light meals for your loved one, and assist with walking, transferring your loved one from the bed to chair or chair to bed, and aid in repositioning in bed. Samaritan hospice home health aides provide gentle, hands-on care in private homes, assisted living or nursing home facilities, rehabilitation facilities, or at Samaritan’s inpatient hospice centers. 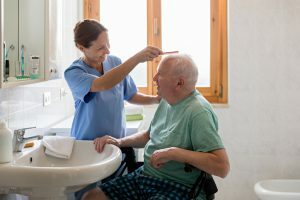 This intimate and professional care wraps your loved one in dignity and cleanliness to provide comfort during this time. Keeping skin clean and dry also helps prevents bed sores (pressure injuries), an injury to the skin and underlying tissue caused by prolonged pressure on the skin. Samaritan promotes a clean and safe environment for your loved one. 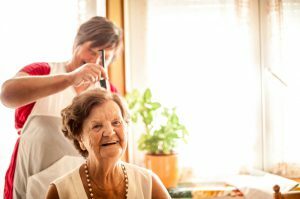 Your CHHA assists with washing and changing your loved one’s bed linens and putting a load of laundry in the washing machine or folding a load as time permits. They also perform light housekeeping of your loved one’s immediate area. Monitors and assists with meals. The CHHA turns and re-positions your bed-bound loved one. When your loved one is re-positioned, it helps relieve pressure on the area of skin or side of the body that they were laying on. This movement aids in the prevention of pressure injuries because it allows for better circulation to the area. The CHHA also provides skin care with appropriate creams and lotions. If you have any questions about hospice home health aide care, please speak with your hospice nurse or call us at (800) 229-8183.